Ahhhh, food. Some of us eat to live, others live to eat. We Americans can be found at both extremes and everywhere in between though this is not the standard perception among most Europeans. Due to the global broadcasting of TV shows like Heavy, Huge, The Biggest Loser, and others who picture their over-sized “stars” sweatily hoisting super-sized sodas into the cup holders in their mega-sized cars just so they will have the stamina to drive down to the mailbox and back without breaking out into a cold sweat, we are viewed collectively as lazy, gluttonous, and wasteful fast food junkies. In direct contrast to the five gallon buckets of soda that the average American SUV’s drink holders will fit, many vehicles here don’t even have cup holders and SUVs are largely nonexistent. The lack of cup holders is explainable in two, simple ways. The first is that you wouldn’t want anyone to take their eyes off the road – or one hand off the wheel – to forage for their drink while careening down the Autobahn at Mach80. Trust me, this is a job best suited for having both hands clamped firmly on the steering wheel in a white-knuckle death grip while listening to Sammy Hagar and screaming “ICH KANN NICHT 155 FAHREN” (I CAN’T DRIVE 155)! 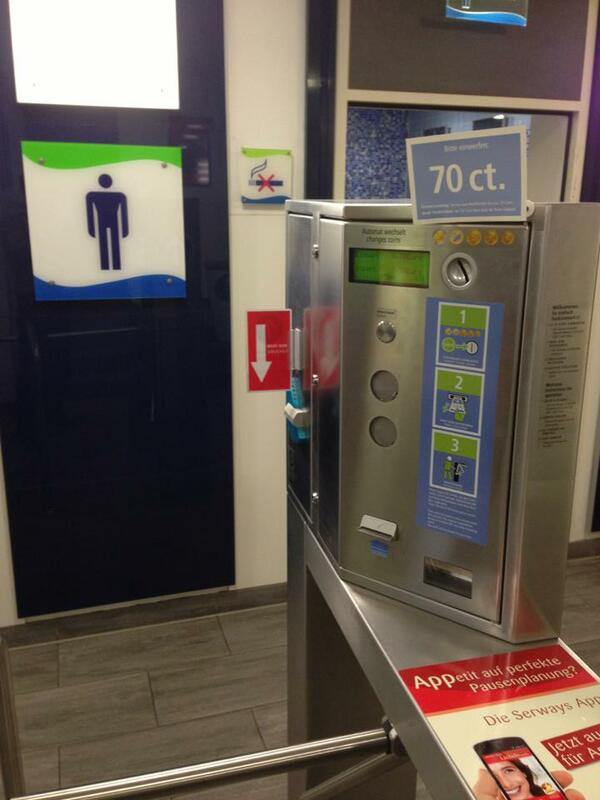 The second is that the rest areas along the Autobahn contain pay toilets. Everyone here knows this (except tourists and, until a month or so ago, me) and so no one really drinks while driving which means that there is no need for cup holders. On a side note, the pay toilets themselves are actually quite nice: They are clean, they smell nice, and once you leave the turnstile that you had to drop 70 cents into to enter, it gives you a 50 cent off coupon which is redeemable at the store upstairs for food or, you guessed it, another drink. From a business standpoint, this is pure genius. Considering the aforementioned size of the cup holders in the States and that every car has one (or four), and the fact that we Americans drive everywhere, especially in the summer when our cars’ AC is often the only respite from the heat, if Uncle Sam put pay toilets along American interstates, the federal deficit would be paid off in no time. Pay toilets may seem strange, but trust me, paying 70 cents to not stand in a yellow puddle is worth it. You can always use the free voucher to buy a bottle of lemonade and dump it at your feet if you miss the States. As for the smaller size of vehicles in Germany, this is due partly to environmental awareness (there are no oil lobbyists here suppressing climate research) and partly to economic responsibility (because there are no oil lobbyists, gas here is very expensive). Mostly, however, the reason for the smaller car sizes here is that any vehicle wider than three sheep standing side-by-side would get stuck in many of the narrow streets. This is not due to poor planning or lack of space, but because of the age of the cities and towns that the roads meander through. Europe is old and I don’t mean “Yankee Stadium” (the old one) old or even “George Steinbrenner” old. I mean “the Colosseum hosting the wholesale slaughter by paid for brutes of their opponents for the amusement of Nero” old… Okay, okay; same thing. Anyway, the roads and byways of ancient Europe, and therefore Germany, were not built with consideration of the future gas-powered behemoths of modern transportation. They were instead built to accommodate horseback knights, small carriages, and farmers walking their hordes of bleating and soon-to-be Lammbraten from pasture to market which, finally, brings me back to my original point: Food or, in German, “Essen”. The title of this post “To Eat or Not to Eat”, is(st) eine doofe Frage (is a stupid question). “Isst” is the German past tense form of “eat” and is an example of me being clever with the language. The fact that I had to point that out means that the joke is hilarious. Back to the point, German food is actually incredibly tasty and seems to have an undeserved reputation in the U.S. as being bland. This rumor was presumably started and propagated by Germans living in the States who want that secret contained so their favorite yet vacant restaurants aren’t overrun. I don’t blame them. One of the benefits of living here is that food is a large and ubiquitous part of the culture and, because of that, there is an endless supply of restaurants where you can enjoy a fantastic meal in relative quiet. That is, unless you choose to sit at one of any town’s Marktplatz restaurants’ outside seating as each Marktplatz has at least one church looming over it and its gonging bells will drive you completely insane. I’m pretty sure that the free bread that they give you when you sit down is not to eat but is instead meant to be stuffed in your ears. Now, rather than my normal “brain-dump” style of writing in which I ramble on until most of my readers find something better to do like perform self-lobotomies, I have decided that the most efficient and authentic way to convey the complete German food experience is to take you through a day’s worth of typical German meals by retelling the story of my first visit as seen through the eyes of my stomach. Because the content has at this point almost exceeded the length of my others posts, I am forced to break this one into two parts. As in America, breakfast (or Frühstück, as it’s called here) is the first chance of the day to make a bad decision though Germans rarely do, in spite of the quantity of food that sits on the average breakfast table. Allow me to explain: During my first visit to Germany, I stumbled downstairs at around 10:00 am (though because of jetlag it was and felt like 2:00 am) to find Eve’s and her family’s expectant and smiling faces sitting around a table that looked as if someone had dumped the entire contents of the fridge and half of the cupboards onto it. It was piled with plates, knives, juice, butter, jams, cured meats, honey, fruit, Muesli, coffee, and eighty-six different kinds of bread. Now that I think of it, I’m pretty sure that the creaking I heard at that moment was not my overtired joints acclimating to the early hour and changes in air pressure but rather the table itself groaning under its massive culinary load. Despite the enormity of the food presented, however, most people at the table had only a few Brötchen (like bread rolls, only somewhat bigger) with jam and a cup of coffee. I, however, being an American who was half-drunk from lack of sleep, had seen this type of thing before through blurry eyes, and so immediately recognized it as the all-you-can-eat Vegas buffet that it clearly was before diving in with gusto. When the dust and crumbs settled, I had consumed no less than a bowl of Muesli, a large whole-milk yogurt, three “big bread roll” things, four cups of coffee, and a sausage. Needless to say, I spent, like so many others who have consumed too much alcohol or too little sleep, the rest of the morning regretting my poor decision. That was, until someone mentioned…lunch. Well, it was about 1:00 pm at that point; who was I to say no? I mean, these people have to eat whether or not there is an American milling about and grumbling about his belly, right? Plus, a little hair of the dog might make me feel better, right? Wrong, because someone suggested that we go to McDonalds (that person may have been me) and, though Eve’s family doesn’t eat a lot of fast food, they all reluctantly agreed. Our fate relinquished and now resting comfortably in Ronald’s hands, we all piled into Eve’s sister’s F14 Tomcat – which was cleverly disguised as a BMW – and headed off toward the Golden Arches and toward what would turn out to be my second bad decision of the day. Pulling up, I noticed that the exterior looked pretty much the same as any other Micky D’s that I’d seen, save for the gargantuan gate/street sign cutely proclaiming that the drive-thru road had been named “McDrive”. The inside, however, is an entirely different story. The first thing that I noticed was that the outside door was manual and weighed roughly eight tons while the second, inside door was automatic. I can only presume that the reason for the heavy door is to deter the truly out of shape people from entering, gaining even more weight, and then destabilizing the government healthcare system. The automatic door, on the other hand, is obviously just a reward for those that passed the first test as there is no reason to overdo it. After all, this is Germany and not Austria, right Arnold? Once inside (and once my muscles finished seizing), the next thing that I noticed was the menu. Though just as brightly colored as the ones stateside, this one had only a few recognizable items like the Big Mac and the McChicken sandwich. The rest was entirely new and…completely fascinating, i.e. ; utterly weird. There was the Hamburger Royal which looked like the old Big & tasty on steroids. There was the Los Wochos which seemed to be a Hamburger Royal with cheese, TexMex spices, and a hot pepper/ranch dressing with…corn. 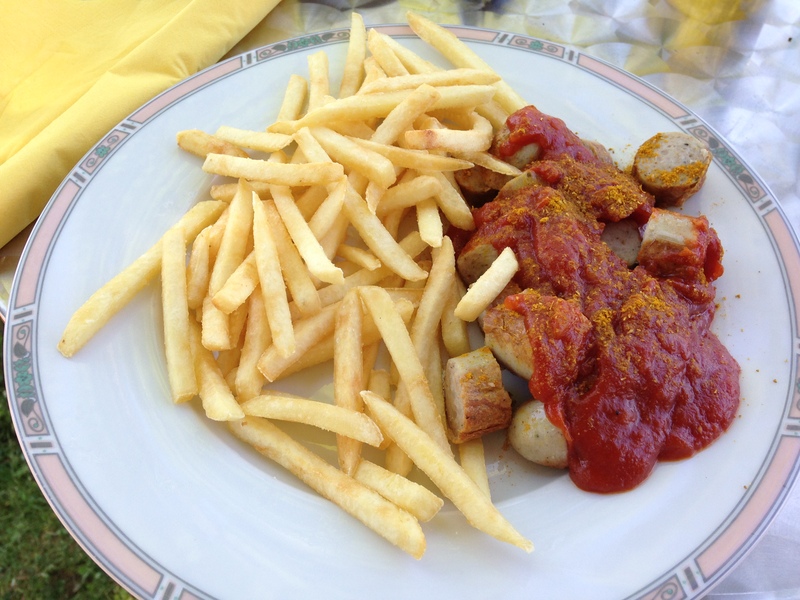 And…there was the McCurrywurst. For those of you unfamiliar with this particular delicacy, Currywurst is a pork sausage slathered in curried ketchup, sprinkled with curry powder, and served with curry dusted French fries and a side of mayo. It may sound strange but it is, in fact, quite delicious. Unfortunately for me, I opted instead for the Los Wochos, though this is not what did me in. Currywurst: 50% Indian, 50% German, 100% delicious. To the left and separate from the regular food counter is a free-standing, and somewhat chic looking, McCafe where they serve Starbucks-like lattes and cappuccinos, complete with whipped cream and flavored syrups. They also offer, gleaming smugly from under a seductively lit glass case, delicious cakes, pies, and other evil confections. These are the little bastards, specifically the cakes, which almost killed me. After getting hopped up on trans fats and Coca Cola, one’s brain does not function properly and, like a UMASS freshman away from the watchful gaze of his parents and hammered for the first time, does not want the party to end. After the mere seconds that it took me to devour a slice of chocolate-Schokolade McKuchen and a Maß (bathtub with a handle) of McMocha, and after the even more brief sugar rush where I may or may not have sang “The Big Mac Song”, my blood sugar plummeted, the inevitable sugar crash caught up my jet lag, and the lights went out. Imagine what would have happened had I ordered a beer or two. Yes, beer. At the risk of being the cause of a mass emigration of Americans to Germany, McDonalds in Germany serves beer which is yet another example, like pay toilets along the Autobahn or putting a donut shop next to a medical marijuana store, of a brilliant business strategy. What’s the food that most people crave after a night of drinking? That’s right – McDonalds. Add to this the facts that one can legally drink beer here at 16, that one can’t get their driver’s license here until they turn 18, and that the blood alcohol limit for bicyclists here is a whopping .16, and you have not only a great way for adults who are adept at making bad choices to make one more before heading home after a night of imbibing, but also the perfect teen hangout destination. Greasy food, brightly colored décor, beer, piped in pop music, and most of their friends working behind the counter (you know darn well that many a McKeg has mysteriously disappeared). For crying out loud, they even have playgrounds. Now the party can start where it would normally end but instead of little Gretchen falling behind the wheel and playing parked-car pinball with daddy’s Mercedes, she can just climb onto her Fahrrad (bicycle), ring the mandatory bike bell to prevent oblivious trees from carelessly wandering into her path (they do that when you’re drunk, the sneaky bastards), and wobble her way home while using a happy meal box as a helmet. I’ll tell you this, if there is such a thing as reincarnation, I’m lobbying Buddha, the Universe, or the holy burger-wielding clown himself, to come back as a kid in Germany. Random adult: “How’s your Quarter Pounder…er, sorry “Royal with Cheese” and beer, little Jim”? Little me: “Buh-duh-duh-duh-DUHHH (McDonalds jingle), ich liebe es!” (I’m loving it)!